This traditional treat has never tasted this good! 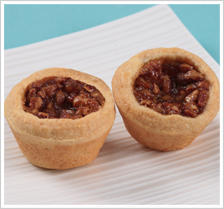 Whether filled with a time honored pecan butter filling or a refreshing variety of fruit fillings, each tart starts off with carefully prepared golden pastry for the perfect mini tart experience. Try it on its own, or topped with ice cream, fresh fruit, or chocolate.